Another gator pic I took in Florida's Gatorland. This time they're going for some chicken. Funny thing is, these alligators taste like chicken (they served alligator meat there and I tried it for the first time since my toddler years). A shot of an alligator reaching up for something down at Florida. Took it myself and I must say it's quite nice for something I took on my phone. Does this mean no more serrated tongues in non-avian theropods? And that King Kong would have been less likely to bite out that theropod's tongue? It seems that for all their numbers, passenger pigeons actually had a lower genetic diversity than expected. This would have implications for their susceptibility to extinction at human hands. Favorite visual artist Nope; got none Favorite movies 300, Michael Bay Transformers films (some, at least), King Kong (2005), Dragon Ball Z: Battle of Gods, and Dragon Ball Z: Resurrection F Favorite TV shows Dragon Ball Super, Adam Ruins Everything, Outrageous Acts of Science; formerly Deadliest Warrior Favorite bands / musical artists Don't listen to music Favorite books A handful of Michael Crichton's books Favorite writers Michael Crichton Favorite games If only I played video games much nowadays Favorite gaming platform See above Tools of the Trade Have not submitted a deviation here, but I have painted, used computers, etc....for high school art classes Other Interests Fossil fauna (mostly vertebrates), Dragon Ball franchise, Transformers franchise, wild fauna, warriors and weaponry, and some other things I'm forgetting. About titanosaur lateral bracing. I was blocked by asuma, so I'll post my reply here. 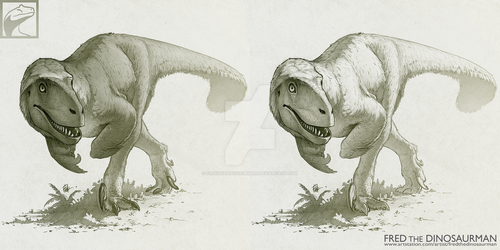 Um, I cannot really disclose the link right now, its part of a project on titanosaurs. I will link an example image svpow.files.wordpress.com/2009… note the prominent enlargement of the cervical rib, and transverse process. Oh, thanks for telling me about the status of the whole thing. So, if I'm looking at the right thing, there looks to be a rugose texture(?) on the lateral projection; I can't tell if it's post-mortem cracking or an actual feature of the bone. If the latter, that would indicate keratin (like in apatosaurines), right? Yeah, if its rugose there would be keratin covering the rugose region.